I did some entertaining last weekend which necessitated purchasing two dozen eggs. 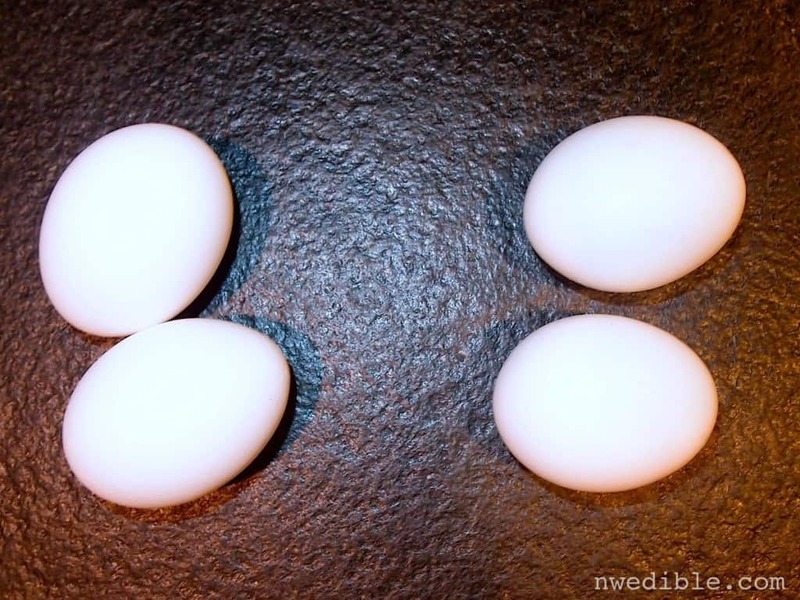 I had a few eggs left over, which allowed me to perform a side-by-side comparison of good quality store bought eggs with my backyard hen’s eggs. 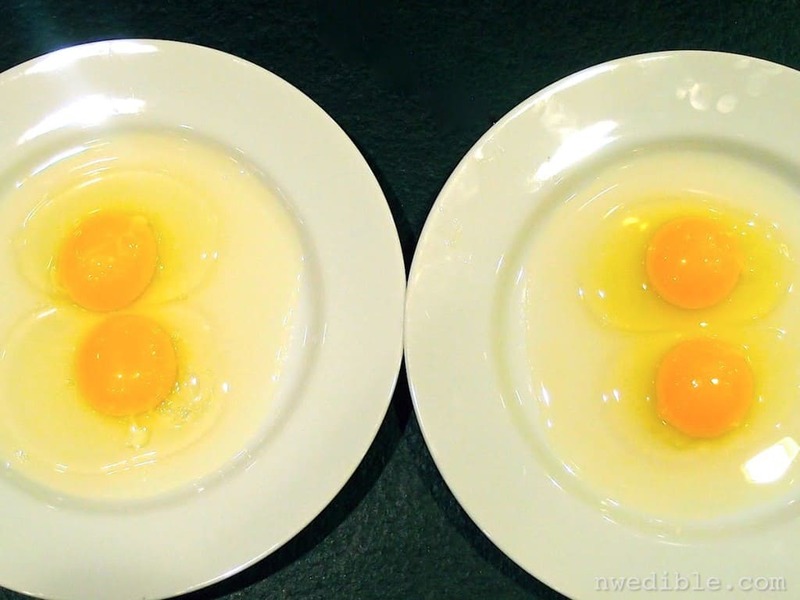 Left: store bought eggs. 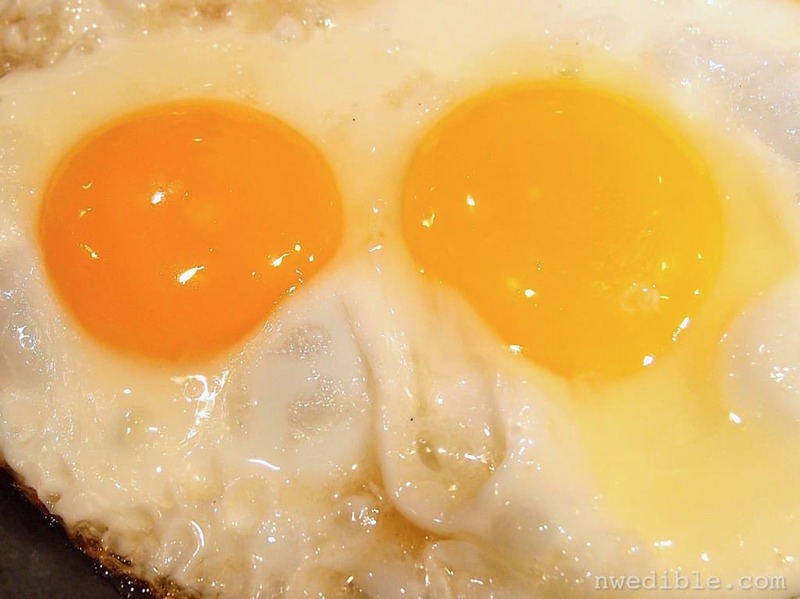 Right: backyard eggs. The backyard eggs come in various other shades as well. 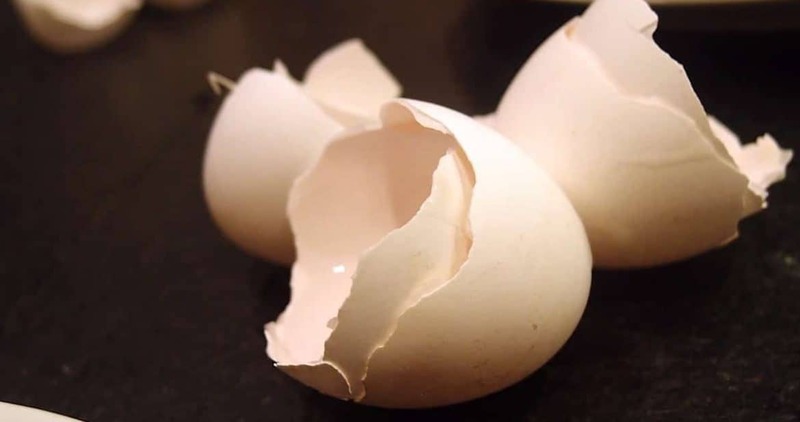 The store bought egg shells (background) were easier to crack. 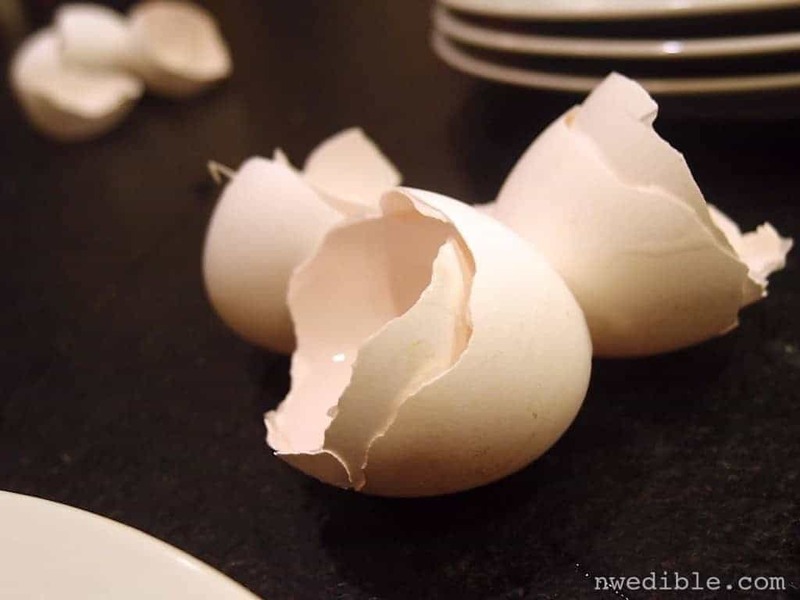 They shattered more cleanly, and the shell seemed thinner. The backyard eggs (foreground) tended to have a greater elasticity in their shatter. I believe this is because the bloom is intact on the backyard eggs but is washed off of all storebought eggs. Left: Store bought. Right: Backyard. Under my less than ideal lighting, it is hard to detect huge differences. The backyard eggs seem slightly brighter and more golden, and “stand up” better than the store bought. I believe the color difference would be more dramatic in the summer, when the chickens eat a larger proportion of forage and vegetable scraps. The color difference is much more apparent once the eggs are in the pan, next to each other and under the halogen task lighting above my stove. Store bought eggs (background) are much paler than backyard eggs (foreground). Sliding the yokes adjacent to each other makes the color difference even more apparent. Backyard egg is on the left, store bought is on the right. 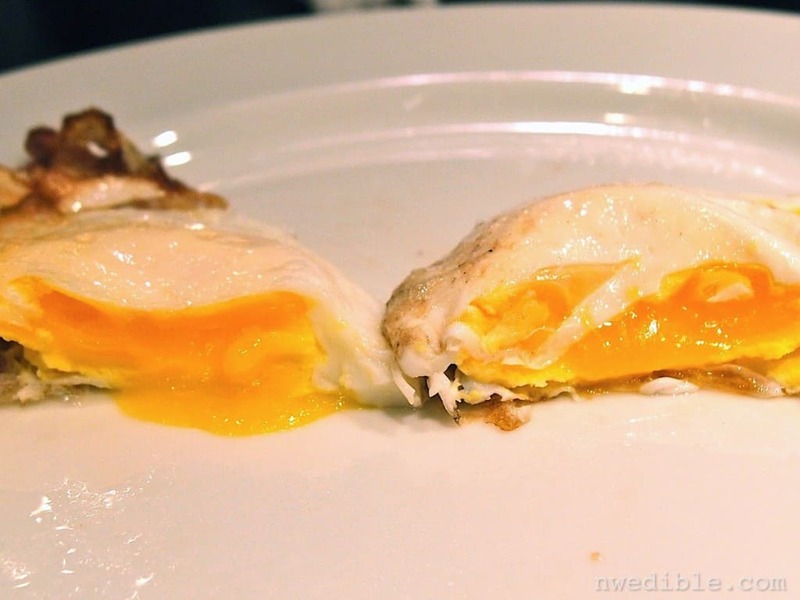 When cooked to over-medium, the store bought egg (left) spreads out much more than the backyard egg (right). The store bought egg (left) has a yolk that collapses when cut.The yolk texture is simultaneously a bit chalky and sticky. The backyard egg (right) has a yolk that holds its shape very well. It remains much more creamy. Kid and adult taste testers who did not know which egg they were eating preferred the flavor of the backyard egg. The kid described the yolk of the backyard egg as, “gooier” which, coming from her, is definitely praise. This was an interesting comparison. The store bought eggs were fresh and of excellent quality, from a local medium-scale producer that does a consistently great job delivering humane eggs at a good price point. I would happily buy and eat these eggs if I did not keep chickens. In contrast, the backyard eggs are currently not at their best, since the chickens are foraging less over the winter and are more reliant on commercial feed. Despite this seasonal handicap to the backyard eggs, they were still the clear winner in color, texture and taste. Are backyard chickens in your future? I grew up with chickens, and look forward to having my own when we finally find our little homestead. I've had this discussion with my good friend over scary grocery store eggs vs. backyard eggs. after introducing her to eggs from a farmer down the road, she's never gone back. there is definitely a difference, and on many more levels than taste alone. love this post. Backyard eggs are already on our table because we buy them from a local homesteading family. We are considering getting hens of our own. The coop could be built this spring if my husband is not sent out of state again to work. Here's more from Mother Earth News on store bought vs. free range chicken eggs. There's also a cost savings: free range eggs at my local farmer's marekt are $4.49 dozen. Thanks for the side-by-side comparison! We're hoping to get a few chickens next year. (We live in town and I think the limit is 5 here.) So I'll be doing a lot of chicken research this winter. Until then, we're lucky enough to get local, organic eggs delivered to our door every week. I see the differences in the eggs here too. And Im grateful to have found an egg farm right here. The owner takes great pride in her chickens and eggs and it shows. She allows them to rest naturally so when the weather turns dark out here for the winter…my fresh egg supply dries up. I tried to find a good substitute and went to the local health food store like she suggested. At almost $5 a dozen they were no better than the junk the stores sell. I actually found Egglands best was the closest to hers. Still not great but much better than anything else I found out there. I dont mind paying more for good eggs, but to pay a high price for something that looks as mass produced as the grocery store….that bugs me. And so I enjoy my fresh eggs as much as I can and when my supply starts to dry up,,,I save the good eggs for fried eggs and substitute store bought for everything else. Of course at some point, I only have store bought and we really feel it. We are so spoiled! 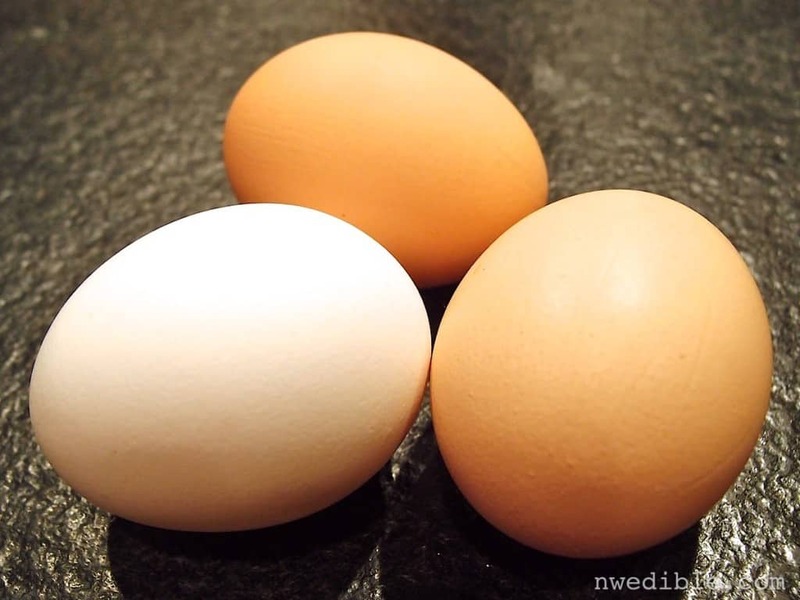 But this is a nice blog and I didn't know that the difference in whites was due to the age of the hens. Thanks! Our plan was for chickens next spring, but it's been pushed to spring 2013. Sigh. Don't want the coyotes and raccoons keeping me up nights trying to get to the chickens, so probably not. Have a friend tho that delivers her backyard hens' eggs – so that is a nice treat for me. I use hers for fresh eating in the pan. 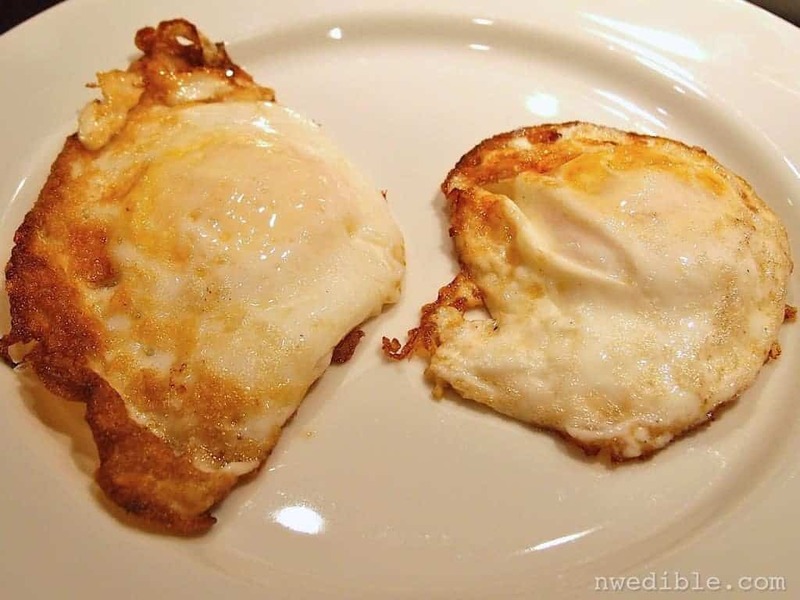 I continue to use the store bought eggs for mixed up cooking – like in batters and in quiches. Happy medium for now. We keep chickens (Rhode Is Red and White Leghorns) for eggs and meat and eat eggs every morning for breakfast. When I'm away on a work trip I order eggs and they never taste as good. Here in Australia the commercial eggs always have a brown shell and the yokes are dark orange. The are virtually tasteless with an awful texture. Compared to our homegrown eggs, which are bright yellow, and full of flavour, I hate being away from home! You are making me hungry, and I'd just like to know how to cook an egg in cast iron with leaving part of it stuck to the pan. The cast iron pan must be well seasoned to start with. And the pan must be warm, but not too hot, already. Then I either use a spray or olive oil, wait til it is up to temp also, before putting in the eggs. Very interesting. I liked being able to see the differences each step of the way. I have actually never tried backyard eggs before (I know!) but have thought a lot about having chickens one day when we have our own place. Mother Earth News did a research project on pasture raised/backyard chicken eggs versus commercially produced eggs. The difference nutrionally was fairly huge. So until we have chickens I can justify the Farmer's Market prices because not only do they taste better they are better for you. Hey Brenda – Marci's technique is a bit different from mine but I'm sure hers works too. Well, well seasoned pan is key. I start with a hot pan and I do not skimp on the fat. I like bacon grease. 🙂 I can flip them in the skillet pretty reliably. I'll make a video and show you in the next few months, how's that sound? My country neighbor gave me a chick that was rejected from the flock..late May, I ran to the farm store, bought two (older, but small like the chicks size) banties to be friends/flockmates. The chick and one of the bantie's are now laying an egg a day…one very small (but still good) and one almost reg sized…but I can tell the difference from store eggs, just as you showed – love it, AND I know WHEN they are layed/laid – unlike the storebought ones. Since there are only two, sometimes one, I DO have to buy eggs at the store…but when we have eggs by themselves for breakfast – MY hen's eggs are premier on the plate! I live in Vancouver, Canada and I would like to have a couple of chickens. Our recently inacted by-law giving permission for backyard chickens states that the chickens must be hens older than 4 months and that the chickens can only be killed (euthanized) by a vet. So, it seems like they're really only allowed as pets. What is your plan for when your chickens get too old to lay? This is a very important discussion because three are so many sensibilities to consider. I think I will do a full post on it in the future. Anyway, while I personally have no issue with humane backyard slaughter (within reason), in a situation like yours it would depend on the wording of the law, for me. If animal slaughter or processing is forbidden *in your town*, I would consider taking your live birds to a rural or unincorporated friend's home to process. If that isn't a sufficient work-around, I suppose vet euthanization might be necessary. Pity, tough, as I imagine that would render the meat inedible. Very good post! When I did a side-by-side comparison a few months back I got very similar results, but my eggs are clearly large vs extra large. Of course my post was short and incomplete. Frankly I would love more cooking posts. I need to win the lottery and go to culinary school. Hehe. What do you do with all those eggs? I give mine away. Thanks Marci and Erica – looking forward to the demo!!! I've read about some people having success changing city ordinance regarding chickens. May possibly be some help on the link above. I remember reading about a family getting around their ordinance by "egg farming", rather than "raising chickens". This is a frustrating topic for many who feel the strict regulation steals from them their control over their own food choices. noticed small red/brown dots in the yoke in some back yard eggs I get from a friend. What would that be? Backyard eggs are the most expensive, delicious and enjoyable eggs you will ever eat. By the time my “savings” make up for the cost of the birds, feed, fence and materials for a coop I built myself, I will be a much older man and my children will have graduated from college. But, the chickens work some poor parts of the yard, till the garden, eat the compost and the bugs. They are a great compromise between housepets and no animals at all. We’re new to chickens and have had our girls for just under a year now. I was wondering about the thick shells. I thought maybe we were giving them too much oyster shells. Good to read that this is typical. Hey There. I discovered your blog the use of msn. That is a really neatly written article. I will be sure to bookmark it and come back to read extra of your helpful information. Thanks for the post. I’ll certainly comeback. 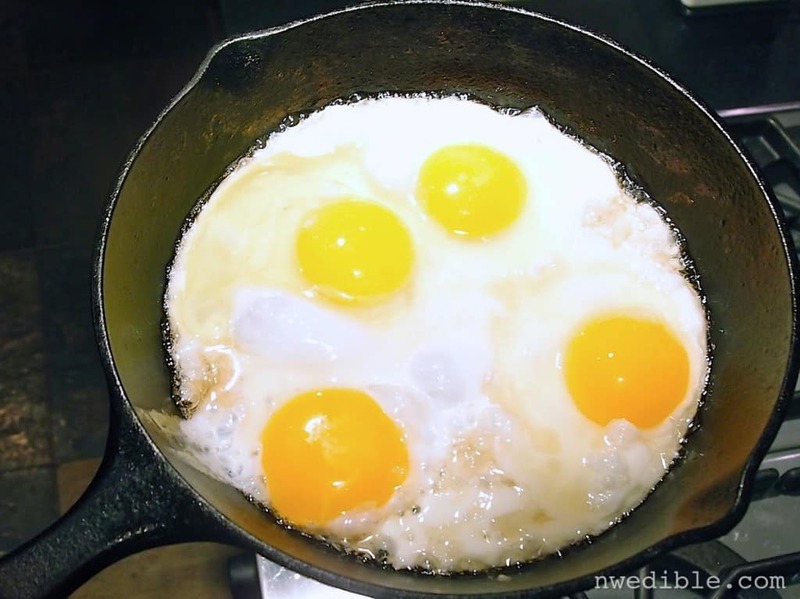 Thanks for finally writing about >Backyard Eggs vs.
Store Bought Eggs: A Side-by-Side Comparison | Northwest Edible Life <Liked it!